With summer just around the corner my skin has been feeling the affects of the long winter months. The cold winter weather leaves my body dry and recently I have been dealing with eczema, something I've never dealt with before. So with bikini season upon us, my skin was in serious need of moisture and some rejuvination. Since my obsession for body products is growing and so is my interest in maintaining glowing moisturized skin, I wanted to share some of my tips and favorite products to achieving healthier and shinier skin. A few months ago at an event I received a shower body scrub in a goodie bag, since then I have been using it and loving the results. Not only does it feel great but it washes away any dry skin your body has on a daily basis. For mothers day the ladies in my family and I went to the local spa and I decided to get a full body scrub as my treatment. I have never done one of these before and figured I should try it out now since my skin has been majorly needing it. I highly recommend going for one of these if you have not done so before! The scrub is the perfect way to rid your body of all of the dry winter skin. I left the treatment with the softest skin I have felt since I was probably a baby... not even kidding. I was glowing and I felt extremely moisturized. I know spa treatment can be expensive so if you can't spend the money opt for a bath scrub like this one or this one . I have used both of these scrubs before and love them! I seriously use coconut oil for everything, which is the best moisturizer for your body! After my daily shower scrub I like to moisturize with the coconut oil, which literally locks in the moisture. As I mentioned above, I have been dealing with eczema so the coconut oil helps with the itching as well. I also like to use this as an eye make up remover which doesn't irritate or dry my eyes out. It is said that using coconut oil under your eyes every night can reduce bags and lines . Last but not least, in the summer I like to use this as a highlighter when I am going more natural. Placing some coconut oil in the corner of your eyes and on the top of your cheek bones will give you a nice glowing look. I was recently introduced to Kopari products and I highly recommend trying the Coconut Melt . 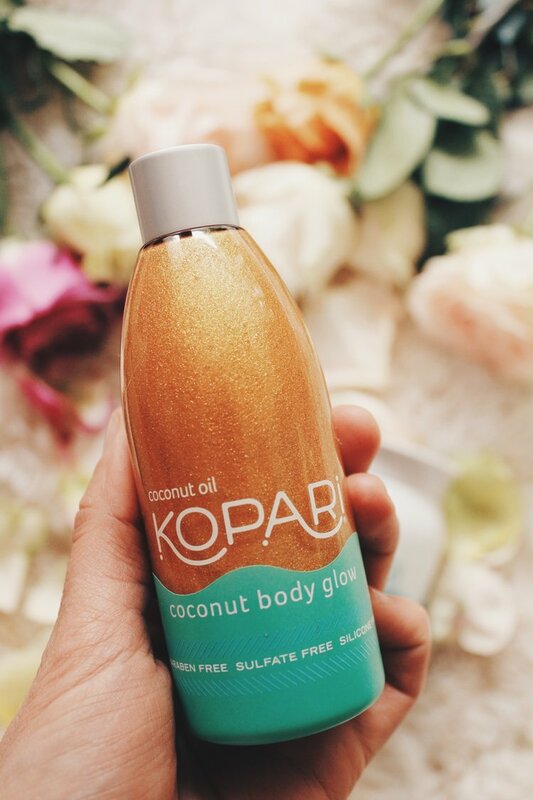 Another one of my favorite products is the Kopari Coconut body glow leaving my skin shimmering, moisturized and smelling amazing! Ever since I was a little girl I would watch as my mother would cut a piece off the aloe plant in our house and apply to her face every night! A few years back she brought over an aloe plant to our apartment as a gift and told me all of her secrets. The list of ways to use aloe was endless. Not only does it help moisturize your skin, it helps to cure acne, fight signs of aging and helps your skin really glow. You can either invest in a little fresh aloe plant or this aloe mist is a great product. As mentioned, these are just a few of my favorite products and tips for keeping your skin looking healthy and moisturized. I am always looking for new products to try, if there is anything you use and think I would love, leave your recommendation in the comments below!